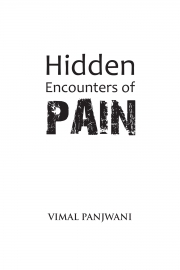 Description of "Hidden Encounters of Pain (eBook)"
The Author is an engineer and MBA graduate from Symbiosis International University. He is currently working with a reputed FMCG firm in Goa as Business Development Manager. He is passionate about writing his observations and experiences penning down the thoughts that are never expressed or conveyed. Besides writing he loves dancing and travelling. He has been a freelance journalist and writer for Times of India city circular for Ajmer. He plans to publish two of his works every year. Currently he is working on his own story which is planned to be published at the end of this year. Reviews of "Hidden Encounters of Pain (eBook)"
Hidden Encounters of Pain is in my witness the first book that has portrayed the emotions (hidden emotions) of a woman correctly in our so called modern world. this book has portrayed emotions of a woman as a friend, sister, girlfriend, wife and mother in very simple thoughts. Though this book is dedicated to Women, it also shows the pain in Friendship. All the stories in this book have brave characters and pose a strong message to understand and respect the emotions of our counterparts which we often unknowingly neglect. I really appreciate the thinking of the author and understanding the minute details of a woman's emotions, sacrifices and the hidden pain that she carries in herself, and at the same time spreading the message of Love and respect among human. Reading this book made me realize some of my own mistakes and the way we sometimes behave with our dear ones. As the author of this book says, try to change with Love..
Love is the only therapy that can heal the hidden pain and emotions of the broken and bring our world more close emotionally.Love, care and most importantly respect for women can bring peace to the society. Friendship , family and any relationship are important in our life. The author wrote story of his friends’experience. Besides woman’s pain I also saw the pain with broken of friendship. Sometimes writing can be a kind of treatment. Through this book I had heard many stories of women.As a women,no matter what race you are.We all hope can being in love and get happiness.But no one can promise you.The characters of this story are strong inside especially Vijay’s mom. We can change our self to make the society justice. In different culture had different situation. But true love will be surmount any obstacle.Hope people can overcome this situation to fine the real love.